Oldie diary entry: Oldie of the year awards, destination romance? Lo and behold, if The Oldie of the Year isn't the chance to meet your soulmate! There’s Oldie dating, and then there’s The Oldie of the Year awards. On Sunday we saw a reference to The Oldie in one of the most unlikely places – the Sunday Times Style magazine. Not only that; it was in the back-page dating section which bills the ‘Traditionalist’ against the ‘Modernist’. 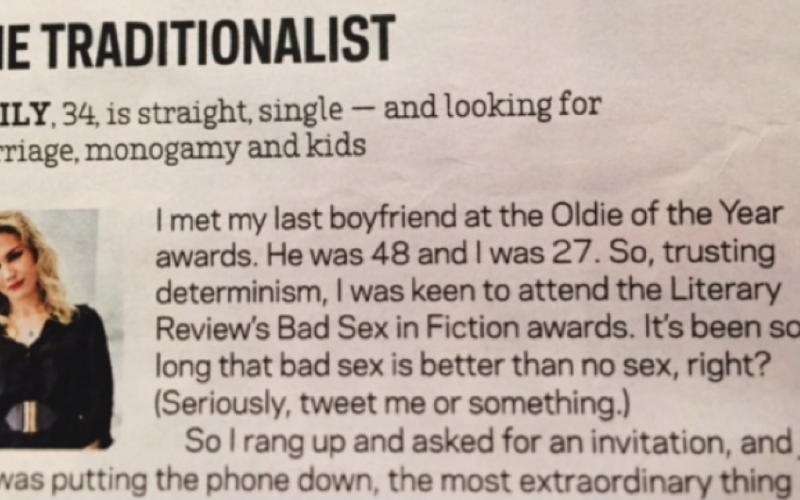 The Traditionalist, Emily Hill, is seeking ‘marriage, monogamy and kids’, whereas the Modernist is ‘bisexual and in a new relationship after two years of swiping right’ (a reference to the popular Tinder dating app – where you ‘swipe' to find the partner of your dreams). Anyhow, in this piece Emily talked about meeting her (now ex) boyfriend at the awards. This was cheering news to us. Will many guests meet their match this time round? Flirtations between the mounds of treacle sponge and steak and kidney pie – the perfect breeding ground for a highly traditional 2018 romance. We’ll keep you informed in this e-newsletter. 11 December. Roger Lewis in the Oldie calls me ‘trademark lugubrious’. I rather like trademark lugubrious. It makes me sound like the latter-day equivalent of the 17th-century Praise-God Barebones. Trademark Lugubrious could be a character out of Ben Jonson.